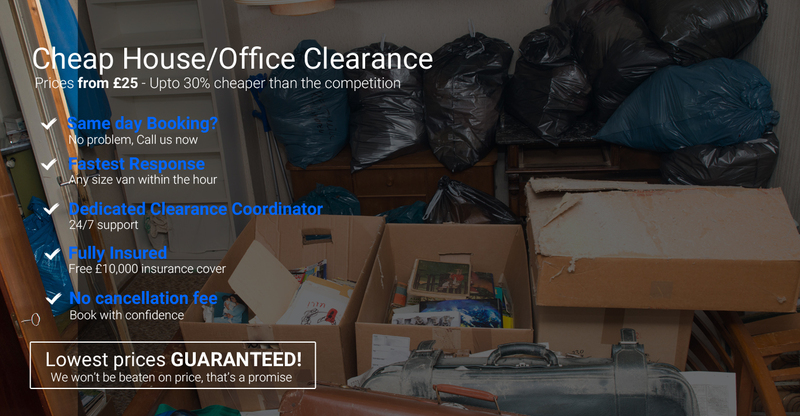 LOWEST PRICES GUARANTEED ON HOME OR OFFICE CLEARANCE + A LARGE FLEET OF FULLY INSURED VANS BACKED BY A DEDICATED TEAM OF PROFESSIONALS. At movevan.co.uk, We are the best clearance service provider in the UK, We have over 300 professionals in our workforce. Whether it’s about clearing your home, office or any other place, you can rest assured that movevan.co.uk will be more than happy to assist. We don’t just help with clearing your unwanted or obsolete items, but we dispose of them in an environmentally friendly way. We achieve this either by donating your extra stuff to recycling centres or donating them free of charge to charitable organisations. No matter what your clearing scale is, our skilled professionals are ready and always eager to assist you. Tell us what you need to clear and get an instant quote with unbelievable low prices.